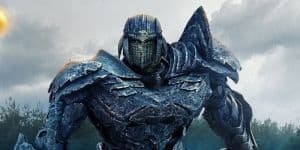 Transformers: The Last Knight Review | Nerd Much? It’s been literally almost 10 years since Michael Bay started directing Transformers movies and honestly, it’s rather stunning this franchise has made it this far. While Transformers: Dark Side of the Moon was okay, the other three films are absolutely awful with very little redeemable qualities. 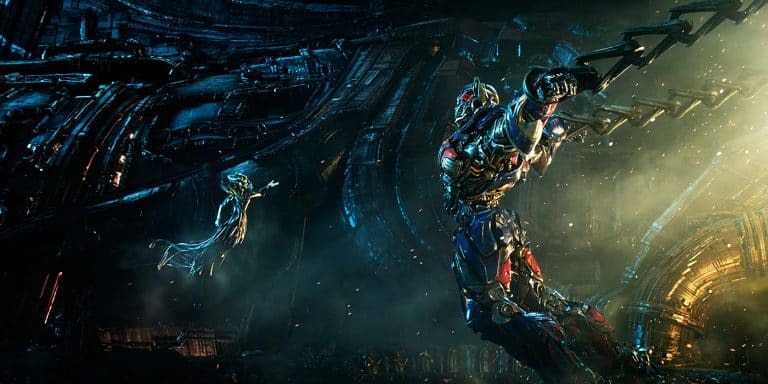 Despite sounding like an exaggeration, let me assure you that Transformers: The Last Knight is not only the worst Transformers movie, but perhaps the single worst film of the year. Normally, I wouldn’t go into spoiler territory when it comes to a review, however, there are so many issues with this film that it’s necessary. So, before we get to the actual spoilers let me simply tell you this is a terrible film and you should not waste your time or money watching it. The story of Transformers: The Last Knight picks up some time after the events of the fourth film with Optimus Prime (Peter Cullen) out in space on the search for his people’s creators. Meanwhile, Mark Wahlberg’s Cade Yeager is living in a junkyard with the other Autobots because they are being hunted by another secret government paramilitary organization. One thing leads to another and Optimus is corrupted by his creator and is tasked with finding the Staff of Merlin, which is just another magic space item that has world ending properties. Yaeger is recruited alongside a professor named Vivian Wembley (Laura Haddock) by the last member of a secret society, Sir Edmund Burton (Anthony Hopkins) bent on preserving the Transformer’s history. It turns out that this mysterious staff can actually be used to rebuild Cybertron, which has been brought to Earth (for the second time) by the mysterious creator known as Quintessa (Gemma Chan). Also, Megatron (Frank Welker) is involved for literally no other reason than to act as an antagonist. There’s a small sub-story about the paramilitary outfit temporarily allying with Megatron, however, it’s so innocuous to the plot the film just drops the idea completely about half way in. In fact, almost all of Transformers: The Last Knight feels like a bunch of half-baked ideas that were all stuffed into one movie. There are multiple characters that are introduced and appear to be important, but are completely dropped the next scene for no real reason. It’s as if Bay couldn’t settle in on one idea so he just kept adding more into the movie hoping it would all, somehow, connect. Even the various Autobots and Decepticons feel shoved to the side, serving no purpose other than to make things explode when needed. There’s a big scene involving Megatron negotiating the release of his fellow Decepticons that plays out like a bit from a Tarantino movie that feels so completely detached from the rest of the movie tonally you’ll think it’s a different film. It won’t even matter because Bay still hasn’t learned that what people what to see in their giant robot movie is more giant robots. While a few of the Autobots return to reprise their roles from Age of Extinction, certain ones like the Dinobots do absolutely nothing other than stand around and look cool. The worst offenders are by far Optimus and Megatron, with the former having so little screen time you will forget he’s even in the movie by the second act. While the idea of Prime turning on his friends is a compelling idea, it never has enough screen time to actually matter outside of one short-lived fight scene. Megatron, on the other hand, is somehow not Galvatron anymore and it’s never explained once how he got his old form back. There’s no point to his presence and this is by far the lamest and least threatening iteration of him to date. Even the human elements aren’t compelling enough to carry the weight of the film, with many of them offering nothing to plot or simply feeling shoehorned in. Early on in the movie, we get introduced to a refuge named Izabella (Isabela Moner) living in the ruins of what was part of Chicago. Bay spends a lot of time developing her character and relationship with Cade and the various Autobots, but then completely abandons her until the third act rolls in. Yet, there’s actually an interesting concept there because the Transformers have destroyed so much why wouldn’t there be normal people who suffered losses? It could have been a great way to explore how this big war impacted an average person’s life, however, Bay never fully commits to trying to explore this idea. The fight scenes, which normally are the most entertaining part of this series, lack the flair and pacing they usually possess. It feels like Bay has run out of ideas and is simply going through the motions with a lot of his fights. The big Decepticon vs Autobot fights are over too soon and many of the characters get lost in all of the chaos. Even the big selling point of watching Optimus fight his friends is over too soon, with him only acting as an antagonist for fifteen minutes top. Visually, however, the Transformers do look absolutely fantastic and this is hands down the best looking film in this franchise. Where Transformers: The Last Knight goes from bad to downright incoherent is in a big twist that reveals the Earth is actually the world sized Transformer, Unicron. This idea on paper sounds like a neat twist, but is weighed down when you realize that nothing in the past four movies have set this idea up. Why were the Autobots terraforming Earth if it’s a Transformer? How come it took till just now for him to appear? Transformers: The Last Knight doesn’t even bother to answer the basic questions and decides to just end on a cliffhanger without explaining anything regarding this concept. Unicron feels completely stuffed into the plot and ultimately serves literally zero purpose other than to set up the next movie. Transformers: The Last Knight is a terrible, haphazardly stitched together mess that suffers from almost every problem imaginable. It not only managed to turn the idea of a giant robot war into a boring concept, but fails to even keep up with the simple continuity that Bay has previously laid out. Even though the actors give good performances, the writing and story are so bad that you cannot care about them. Battle scenes lack the polish they used to have and the big twists fall flat on their face. This is the worst movie of the year and undoubtedly the worst Transformers movie, which is saying a lot given the second a literal genital joke in a serious moment.